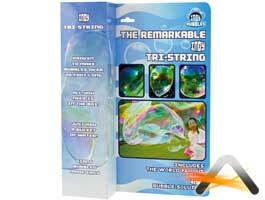 The Indy Tri-String is a truly remarkable piece of Bubbleologist equipment! This set includes a 256ml bottle of Indy Bubble Solution in concentrate form. Simply dilute the concentrate in a solution of 1:6 to water in order to make just under 1.8 litres of amazing giant bubble liquid. The Tri-String can easily be collapsed and assembled and comes with a super-absorbent cord. this special material will hold plenty of bubble solution - enough to make bubbles of 20' in length or more! Instructions are included - everything you need is in the kit - just add a bucket and water to become one of the world's leading bubble performers.